Mashup Links from Twitter has been updated. Now it can work with huge friends lists too. 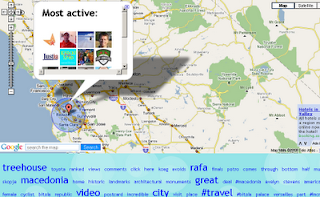 Discover relevant information filtered by people you (or someone you know) follow. Coldbeans Software announced the next milestone in JSOS (servlets office suite) development. JSOS reaches the version 6.50. This largest collection of Java servlets and filters provides 135+ "out of the box" components ready for building web-pages. A practical example: XMPP application on Google App Engine, step by step guide. Our Asterisk stuff is getting an own site. See here a new approach for telecom services development in Asterisk. Code (LGPL) is hosted on Google projects. Last version automatically expands short links (bit.ly). Mashup supports retweet and search (via Google + Twitter mashup). Author's data provided by the Twitter Info mashup. Technically is is a set of public API: Twitter, Google, bit.ly. Server side component has been implemented via Yahoo Pipes. View more documents from Nicholas Zakas. Updated: Bird's eye - yet another mobile web application uses the same W3C principles for getting locations as Geo Mail. Check out this link http://servletsuite.com/bird/ from iPhone. You can copy it right to your phone with this QR code. The latest version lets you see a list of recently replied accounts as well as the links from friends. A new Twitter mashup lets you read all the links from any Twitter timeline: http://tlink.linkstore.ru. Set any twitter name and see all the links suggested by his/her friends. Meta search mashup Got has been updated. Lets you perform a parallel search for Google Blogs and Twitter. An interesting presentation about smart cards. Bird's eye - yet another mobile web application uses the same W3C principles for getting locations as Geo Mail. Check out this link http://servletsuite.com/bird/ from iPhone. You can copy it right to your phone with this QR code. Open Source framework for SMS services: RapidSMS. It works with GSM modems, so you can run your own SMS services without the direct contact with telecom operator. P.S. Check out also SMS gate from JSOS. It has been used in many projects. For example Geo SMS uses it. "Twitter cofounder Biz Stone told Bloomberg yesterday that the microblogging startup hopes to grow faster and better retain users by helping them find other users they might like to follow. To attract more people to Twitter, the company’s designers are also working on a project to help new users discover others who might have similar interests or who live nearby, Stone said." - from here (via Bloomberg). Twitter newspaper - twitter search mashup wraps output in newspaper style. Stay tuned - personalization options are coming. Our bookmarklets suite has been updated. One of the new components (Mobilize data) lets you quickly mobilize any web content. Select any text of the web site you are currently in and hit Mobilize data bookmarklet. The selected text will be transferred to QR code maker mashup, so you will be able to create mobile page (and appropriate QR code) in one click only. A new version lets you see also a list of recently replied accounts. Quite useful tool when you are checking some new 'followed' notification, for example. Mashup gives you a quick snapshot for the new reader. Our collection of bookmarkles has been updated. See it here. Our messaging mashups have been updated. Secure note – lets you publish one time readable text notes, Protected notes – lets you publish password protected text notes. Now both mashups support REST API, so you can create text notes programmatically. Posting automatically recognizes URL's and email's in your text and keeps them on mobile site. So, for example, you can simply share links for mobile users with this mashup. Just type your URL and get mobile page for it (as well QR code for sharing). Blogger.com is celebrating 10 years. So tags cloud is finally a standard widget :-) Details are here. See the results at the bottom of this page. Our new mobile service – bookmarks for files. Mobile site: http://mfile.linkstore.ru. You can load this link right to your phone with QR code above. This application helps you share local files from your phone. Service lets you create bookmarks for files (e.g. media data) from your phone. File size – up 1 Mb. The goal is to quickly share local content: send pictures to friends etc. For each local file service create a separate mobile page (bookmark) that lets readers download this file or share it with the own friends. The usage is very simple, you do not need any registration. For sharing your local file go to mobile site http://mfile.linkstore.ru, type file name and upload the file itself. After that just bookmark the mobile page created by the service.. This new version supports also HTTP API. So now you can create such notes right from your web applications. We wrote recently about reading locations data in web applications. It was just a technique. And here is a bit more interesting example. Mobile mashup Geo Mail lets you share coordinates via email. It is a wrapper for the native email client lets you add a signature with your location info. For example this web application is the simplest way to tell your friend where you are right from your iPhone. You do not need even to type anything. Just hit Send button and send data via email. Depends on your settings application can send a link to the Google map, a link to the static map (just a picture) or just a plain text with latitude / longitude info. You can copy a link to http://servletsuite.com/geomail/ right to the phone with the QR code above. One of the oldest components in our servlets suite – Portal servlet got a huge redesign. Now it is a JQuery based wrapper for your links. Could be used as a starting page in your intranet applications for example.